Crispy Italian Ranch Cups are the perfect last-minute appetizer. Make them and watch them disappear. You know the appetizer that keeps you circling the table to see if there is one more to pop in your mouth? These Crispy Italian Ranch Cups are that appetizer. The holidays are here, and I love having an excuse to have appetizers as my main meal. 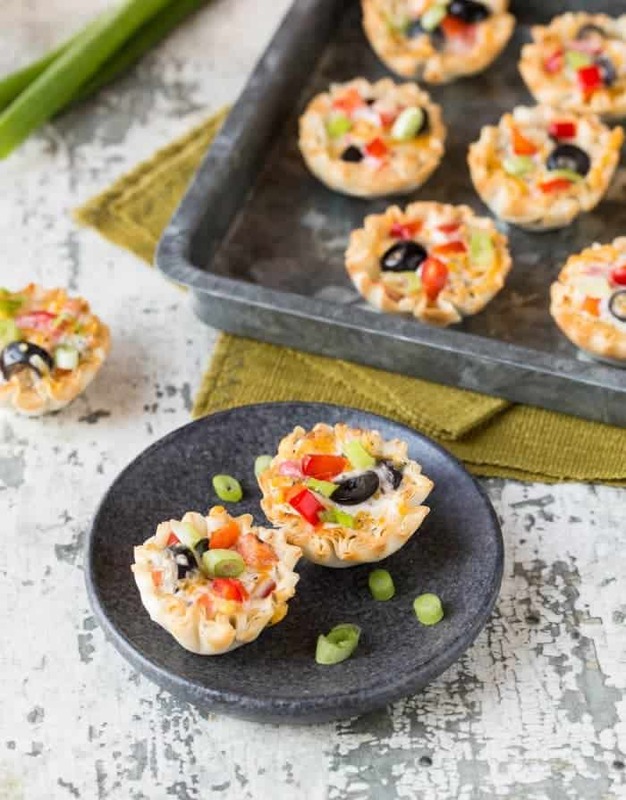 These bite-sized morsels are a fabulous addition to a party spread. I mean how can you go wrong with ooey, gooey cheese, ranch and Italian seasonings, and a crispy little phyllo cup? Crispy Italian Ranch Cups are super easy to tailor to your tastes (or to use what you have in your fridge). I made mine with crunchy red pepper and sliced olives. But the sky is the limit! Have some extra sun-dried tomatoes and caramelized onions? Go ahead and toss them in. The result will be equally delicious. And what about your friends that don’t even like olives? (I know…who are these people?) They gobble them right up and ask about ingredients later. Another bonus? They smell fabulous when they come out of the oven. Addictive and delicious, these easy, make-ahead appetizers tastes great warm or at room temperature. Pretty much the definition of perfect party food, at least in my book. Tip: In the mood for a heartier bite? Add some zippy Italian sausage. So good! 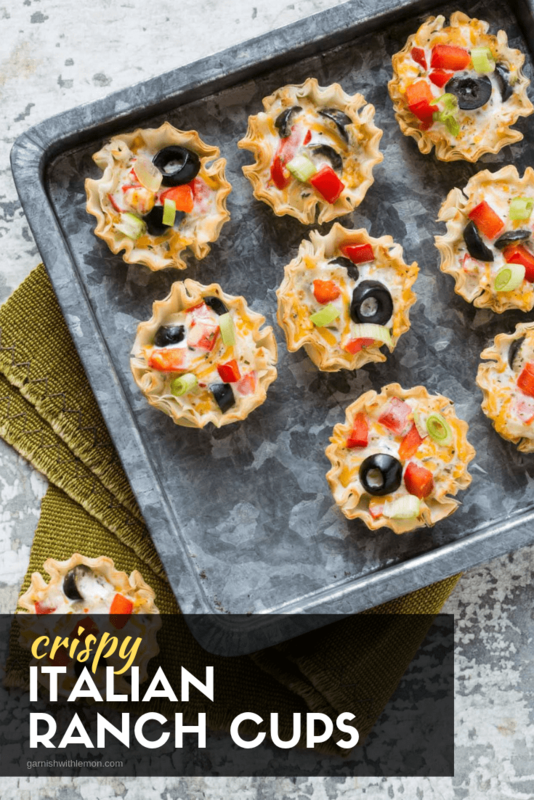 A cheesy ranch and italian flavored appetizer baked in a mini phyllo cup. In a small bowl, whisk together the light mayo and the buttermilk until smooth. Stir in seasoning. Add olives, red pepper and cheese and stir gently until thoroughly mixed. 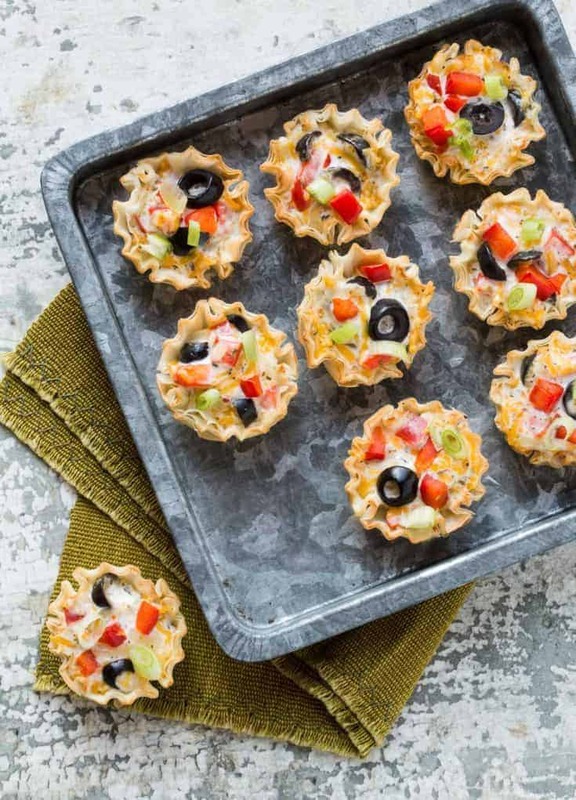 Scoop mixture by spoonful into mini phyllo cups. Place on baking sheet and bake for 15-20 minutes or until cheese is melted and lightly browned. Garnish with sliced scallions and serve warm or at room temperature. LOVE great snacks like this!! Delish. Those sound like perfect Game Day food! OMG, these look awesome. Bookmarking them for my next dinner party! I could eat a whole plate of these! Pinned! These look amazing and easy to make. Delicious for a party or really any time. I’ll take extra olives! Love them! These look great!